One of the key attributes in QRILL Pet are omega-3s. However, the essential omega-3 fatty acids delivered in krill meal are different from the traditional omega-3 ingredients used in pet foods. Firstly, they are bound to phospholipids, a unique and relatively young omega-3 source. Supplemented feed with krill meal, gives dogs the best basis to maintain the right omega-6 to omega-3 balance. Omega-3s found in QRILL Pet have additional characteristics that make them stand out from other marine omega-3 ingredients. They come from a 100% controlled supply chain and are produced with great care at our human-grade facility. Secondly, QRILL Pet is the most sustainable omega-3 source for pets in the market today and offers full traceability. Sourced from the pristine waters of the Antarctica, it is a natural and pure source for our pets. An important nutrient for liver and brain health, choline is a natural part of QRILL Pet. Choline has shown effective results in recent studies. Phosphatidylcholine, such as found in krill meal, has shown beneficial effects in improving memory, treating high cholesterol and protecting the liver from toxicity. Although there are foods and ingredients rich in choline, such as milk, eggs, liver, whole grains, soy and meat, to achieve beneficial effects additional supplementation is required. We all have read or heard about the need for additional protein sources. QRILL Pet might be a part of the solution for pet food formulations. Krill is at the bottom of the food chain and since 70% of our earth is covered by water, it is only natural that we turn to the sea for new protein sources. QRILL Pet makes it possible that an ingredient is tasty and healthy at the same time. It’s highly palatable marine proteins are the preferred choice of many dogs. In an experiment, 9 out of 10 dogs actually preferred the food that included QRILL Pet. 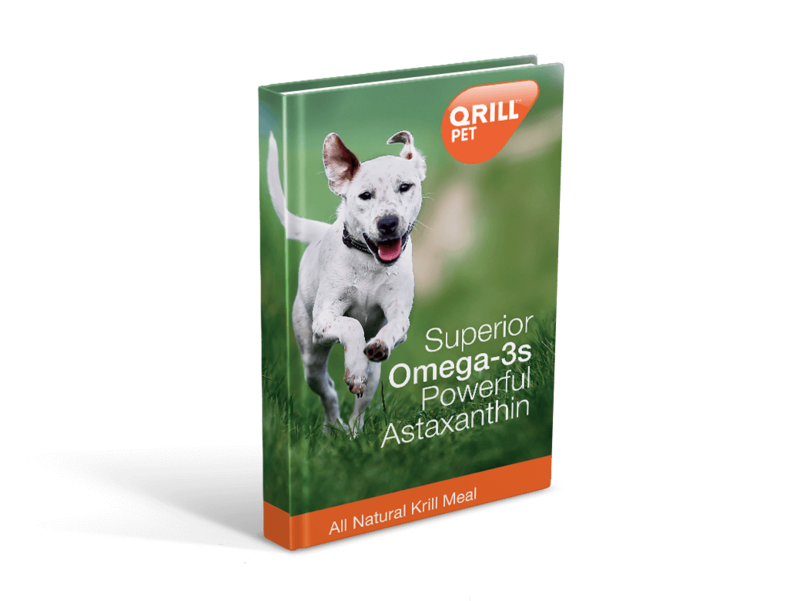 Another natural component of QRILL Pet is astaxanthin, a strong and natural antioxidant. Astaxanthin is a reddish pigment that belongs to the carotenoids group and can be found in certain algea and seafoods. Just like Vitamin E, astaxanthin helps to boost the pet’s immune system and helps to prevent damaging effects of free radicals. Along with the omega-3s found in QRILL Pet, they influence cell membrane fatty acids, the production of inflammatory mediators and oxidative damage. Pet food that contains astaxanthin gives dogs a strong antioxidant defense system.